For those who are struggling with raising kids (young ones and older), I highly recommend this quick read. It is so well written and laid out using Bible scripture as the basis, pointing children to the gospel, cultivating loving hearts toward Jesus, (kids and parents) with very practical application steps. This brilliant workbook is ideal for people who are looking for a study book to help them grow in all areas of their Christian life. There are fourteen chapters/sections, each one dealing with varying issues including relationships, suffering and eternity. Everything is centred on God's love and grace shown to us through the cross of Christ, and the ongoing work of the Holy Spirit in and through us. Each chapter/section explores Bible passages with a 'Questions for Reflection' section at the end. I found everything to be sound, biblically based and spiritually uplifting. I could not fault this workbook and would go so far as to say that, for me personally, this was the best book of its kind that I have used. It contains a lot of great food for thought. I would gladly recommend it for personal, group and church use. My wife and I are reading this together and using it as a tool to generate discussion about our priorities as a family and how we discipline our children. My wife is also using it with her Mum's Bible study group and it is proving extremely useful. It has a really helpful structure and is a good mixture of being chatty with plenty of sound Biblical content. I would fully recommend it to Christian parents. While there are many other resources that go into greater depth on issues of roles in families, idols of the heart, discipline, and teaching children the Word, I have yet to see a resource that is more concise, yet holistic on the issue of parenting. Each chapter is short but packed with content. The discussion questions are heart-penetrating and the ideas for action are practical, giving you tangible ways to build upon newly acquired insights. The first two chapters alone are so worthwhile that I actually wrote “pure gold” at the top of each page. But probably the most notable thing about Gospel-Centred Family is the way it centers the family in the church and views the family as a ministry unit, rather than related individuals. 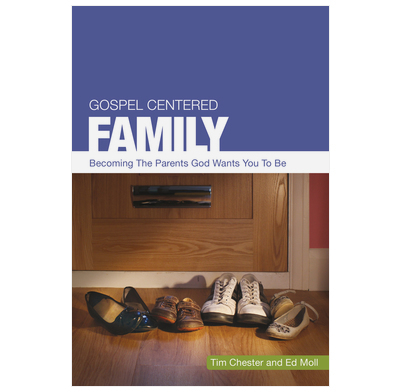 This book challenges us to put Christ at the center of your family life and help you to develop strategies for doing ministry together. Rarely do you see a resource on families that helps us to find our identity in the church and give us handles for family-based ministry. And it does all this simply, without requiring any prior biblical knowledge from the parents. If you want to give the families of your church comprehensive vision for their homes that is centered on the good news of Jesus Christ rather than their immediate relations, get them to study Gospel-Gentred Family. This is an edited version of a review on the Gospel Coalition website here - http://tgcreviews.com/reviews/gospel-centred-family/. This is an AWESOME book!!! However, there are several really awesome parenting books on the market. So, what sets this one apart? Should you really add another book to your shelf? * Concise. - Just five pages per chapter! Twelve chapters. Which brings this book to a little under one hundred pages that pack a punch. Don't believe me? Read on. "We're not calling our children to a life of obligation and hardship that they must tough out. We're calling them to treasure! We're calling them to treasure Christ. Sacrifice there may be, but we count it joy because of the treasure that is ours in Christ…(Philippians 3:8). Our job is not to pressure our children into a life of begrudged duty. Our role is to extol the surpassing greatness of Christ. We're to extol Christ so much that everything else feels like rubbish in comparison" (pg. 19-20). "…when my heart is undivided in its allegiance to God, I respond with calm and loving discipline. But if my selfish desires are ruling my heart, then I'll respond wrongly. My discipline gets distorted by my selfishness" (pg. 27). "This is the most important thing I've learnt in my years as a parent. The biggest obstacle to good discipline is my own selfish heart" (pg. 28). "Let's face it, you and I are pretty lousy parents. Welcome to guilt! What we do with that guilt tells us what we really believe about the gospel" (pg. 32). "If we feel condemned, we won't communicate grace, making us fell still more condemned. If we want our families to be gospel-centred, then we must ring the gospel to bear on our own failures. If we can't bring our parenting sins to the cross, then we don't have any good news to celebrate. We can't communicate grace to our children if we're not communicating it to our own hearts" (pg. 33). "Our children are greatly helped by good parenting. But they're saved by divine grace…But what if you've been a bad witness? God's grace doesn't let us off the hook as parents. Our sin is still sin. It still affect our children and spoils our testimony to the reality and beauty of God's work in us…But it's not unforgivable. Our parenting sins are addressed by God in the same way as all our sin - by grace" (pg. 34). Wait! There's more. While this book is a good condensation of books that have gone before (like Shepherding A Child's Heart by Tedd Tripp and Everyday Talk by Jay Younts), it also brings at least three unique and important points to the parenting book table. * Encouragement to view children as a gift. The reality is that children "...can sometimes feel more like work than pleasure!" (pg. 55) This book contains many suggests for creating memories and enjoying your children. * Encouragement (and helpful suggestions) to live and pray God's Word with your children. * Encouragement (and ideas) to be a mission-centred and serving family. "…God is to be the centre of your family's world. And closely linked to that is a commitment to serving others. A gospel-centred family is a family that serves others to the glory of God" (pg. 88). "…those who have received divine mercy show that same love to others. Those who once served only themselves are freed to serve others in love" (pg. 89). "A family that's turned inwards is not a gospel-centred family" (pg. 89). * Interactive. - Most of the other parenting books that I own have application questions at the end of each chapter, but this book goes even further. It has more of a workbook flavor. The beginning of each chapter has a Bible background box with a passage to read and questions to answer. The end of each chapter has a "Questions for reflection" box and a paragraph of "Ideas for action". One thing that I did disagree with was the ideas suggested for disciplining a child. Chapter 7 in Shepherding A Child's Heart by Tedd Tripp and/or Chapter 9 in "Don't Make Me Count to Three!" by Ginger Plowman are a great introduction to why methods like the ones in Gospel-Centred Family aren't Biblical and are detrimental to your child's heart. Overall, an exceptional parenting resource!! Easy to read, harder to apply. Although the book is short, I'd read it through slowly, savor each chapter, and really take the time to apply the material here. Gospel-Centred Family is simple, accessible, applicable, and profound. Many of us were raised to think that the gospel was something we should accept, not something we always need. This is equally true of parents. Like our children, we need the gospel to start and continue the Christian life. Instead of stooping to bribery, manipulation, behavior management, or emotionalism in parenting, Gospel-Centred Family lifts us up with gospel principles that point to Jesus as our King (not just example), to the heart (not just behaviors), and to understand how grace (not family goals) will transform a child into the image and beauty of Christ. The book is broken up into Four Sections: 1) Gospel-Centred Family 2) Grace-Centered Family 3) Word-Centered Family 4) Mission-Centred Family. Each chapter in each section contains a Principle, Biblical Background, and Questions for Reflection. I’m typically not into this kind of layout. In a lot of books that take this approach make the interaction feel “forced.” Not so with Gospel-Centred Family. Quite the opposite! The questions and principles are helpful and I’m considering using the whole book as the basis for a course in our church. Instead or reviewing each chapter, I will provide a sample review of the book by examining one chapter. Principle: Addressing the heart matters ore than controlling behavior. Biblical Background: Colossians 2:20-3:10. This background shows how Scripture does not advocate a rule-based approach to change, but that identity as a new creature in Christ is what changes us from the inside-out. We all fall into these, some more than others. My wife and I had an honest conversation about where we see one another choosing these behavior control approaches. We encouraged one another to address the heart more often. Calm: The focus of discipline is the child’s hear rather than your emotional state. Clear: Make your commands clear…explain why they are being disciplined. Consistent: Set consistent boundaries..by always following through with warnings…and being consistent between parents. These principles and practices are immensely helpful, but they must be applied together as parents. Make sure you have some discussion time together over these things. Unite in prayerful repentance over failure and joyful resolve to not just change your kids’ behavior but instruct their heart. Parents should never stop talking about how to raise their kids. Fathers should lead out. As children grow older, it is important to move from discipline to self-discipline. As they grow, create times of discussion between parents and children so that you can grow in the gospel together. This will challenge you as a parent to go beyond merely dealing with the surface behavior of your children and instead equip you to go to the heart of the matter...with the gospel! Very practical, easy read with questions at the end of each chapter that are great for family or Care Group discussion.